See KERRA offer which includes shower cabins, massage cabins, bathtubs and sanitary ceramics. Loge is a wide range of bathroom and kitchen fittings. Choose your own tap from hundreds of offered products. 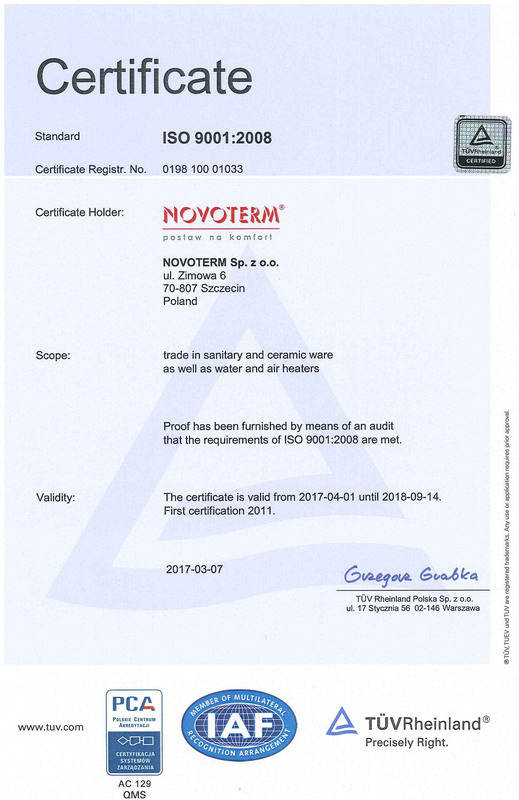 Following a periodic audit conducted on 01.04.2014 we received a new certificate confirming that our operation is in accordance with the quality management standards ISO 9001. In 2010 we started to implement the original quality management system in accordance with the norm ISO 9001. Measure, which is in accordance with the ISO norm, steers our company towards the Client and the fulfillment of requirements. 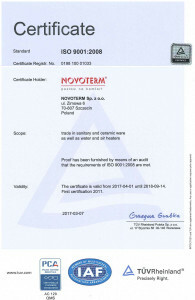 Issued for the first time in 2011, the certificate is an independent confirmation that we effectively manage all elements affecting the quality. The reward for the fulfillment of adopted norms is the satisfaction and trust of our Clients and Commercial Partners. Copyrights Novoterm sp. z o.o. © 2014 All rights reserved.